Heavy industrial plants and factories often require the use of Nitrogen Gas to increase the safety and/or efficiency of one or more process applications performed at the facility. Oil refineries are one such industry that utilize N2 gas for safety and efficiency. 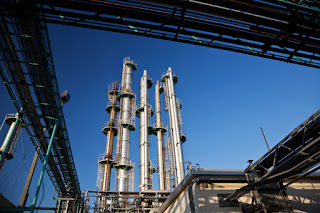 The process of refining crude oil into petroleum-based gas products involves a catalyst reaction that must be carefully controlled to avoid potential, dangerous explosions. Why Use Nitrogen Gas during Catalyst Reaction? Nitrogen gas is used as a purging agent during the catalyst reaction to improve the safety of the process and to protect the workers and facility. N2 gas is injected into the Catalytic Converter system to help maintain the stability of the chemical reaction. Hydrocarbons remaining from the Catalyst Reaction can lead to a potential explosion during the operation. Purging is an application often association with Nitrogen Gas. Nitrogen is a clean, dry, inert gas that can displace the presence of oxygen in a closed environment. Purging with a high volume of N2 gas in a continuous, uninterrupted flow into the closed environment eliminates the oxygen gas that is a vital element for combustion or corrosion. The N2 gas then eliminates the threat of combustion and improves the safety of the operation. Because such a high volume of Nitrogen Gas is required for catalyst purging without interruption, a Nitrogen Generator provides the optimal source of high purity gas. It produces the gas from air using a simple PSA or Membrane technology, without need for gas deliveries or changing out high pressure tanks. A Nitrogen Generator is safe, reliable, cost effective and poses no threat of running out of gas. South-Tek Systems is a leading maker of Nitrogen Generators for heavy industry with worldwide distribution. Our N2-GEN Series is utilized at oil refineries throughout the US and abroad. Contact our specialists to learn more and see how a Nitrogen Generator can benefit your operation: 888-526-6284.